FOR ANYONE with a professional interest in South Asian cinema, Goa’s November Film Bazaar is an essential event. As with other key festivals such as Cannes and Berlin, Film Bazaar represents ‘the market’, ‘the industry’, or ‘the business side’ of film. Such markets often run alongside a public-facing festival, in Goa’s case, the International Film Festival of India (IFFI), now itself in its 45th year. This year’s opening film was “Elizabeth Ekadashi”, a heart-warming Marathi title just released this week across India, while the film’s producers are now hosting exclusive screenings within the halls of Film Bazaar, aimed at boosting the film’s international distribution. Established seven years ago, and organised by India’s National Film Development Corporation (NFDC), Film Bazaar is a trade market for film industry talent and professionals, providing a ‘converging point for buyers and sellers of film rights’ and aimed at ‘facilitating sales of world cinema in the South Asian region and the promotion of Indian Cinema in the international domain’. Spread across several halls and lawns, people come from across India and from all continents to buy, screen and sell finished films, but moreover to ‘pitch’ new projects, either at script stage or, for the ‘work in progress’ section, for films which have reached their rough edit. As an independent film producer and sales agent, with a strong interest in South Asian culture, my days at Film Bazaar are dominated by meetings with writers, producers and directors, searching for projects where the subject matter has a strong instinctive appeal, with some commercial potential, and the opportunity for me to contribute to the project, either in terms of development, or the perspective of an international sales agent. Although my day job for eight years has been in the sales and financing of English language genre movies, this interest in Indian cinema was forged in no small part through my serving as business manager of London Indian Film Festival (LIFF), which led by the vision of Cary Sawhney, has showcased in London the best of cutting edge independent films from across South Asia, meaning from Bangladesh through Pakistan and visiting every corner of India in-between. It’s through this experience, and through several personal trips to India, that I have been lucky to meet many of the new wave of Indian directors, with whom I hope to work, and take on the audiences of the world. In this era of global culture and industry, the Film Bazaar is essential. Hopefully the attendance of Arun Jaitley, minister of finance, minister of corporate affairs and minister of information and broadcasting, is an indication that the new Indian government is serious about supporting the full strength and diversity of India’s cultural industries, and its incredible filmmaking talents. The Film Bazaar takes place at the Goa Marriott in Panjim, situated where the Mandovi River escapes into the Arabian Sea, flowing from a collection of springs in the Western Ghats, a nice symbol for the range of projects and stories which surface during the project market. 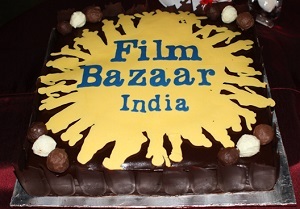 Film Bazaar proved its mettle most decisively in 2013, when two projects which had previously participated in its “co-production” market, achieved notable success: Ritesh Batra’s “The Lunchbox”, and Gyan Correa’s “The Good Road”, both projects being written and directed by a debut feature filmmaker. These projects demonstrated anew the ability of South Asian filmmakers to tell truly universal stories. Further, they showcased the unique characteristics of India, as rich a source of settings and traditions as exists in this world. In the case of “The Lunchbox”, world art-house audiences were introduced to the very concept of a ‘Dabbawala’ and the now famous academic studies which found that less than one in a million such lunchboxes goes astray. With “The Good Road”, director Correa made a heart-warming film in Gujarati, showing world audiences a rarely seen India through the story of a boy who is lost and then found while his family is on a holiday trip to Kutch (in the eastern corner of the state and one part of which nows falls in Pakistan). Most industry executives have a list of films which they wish they’d touched. Mine is topped by “The Lunchbox”, which I had the opportunity to read in 2011. Gems like that don’t come along often, and like every market, the Film Bazaar serves up a mixed bag of people and projects. But if this year’s selection of pitchers bring projects with even half the heart of “The Lunchbox”, or something as distinctive as Bengali director Q’s ‘Tagore-on-acid’ masterpiece “Tasher Desh”, or as gentle, intelligent and fulfilling as Anand Gandhi’s “Ship of Theseus” (all previous attendees in Goa), then Film Bazaar will remain an essential event on the international film calendar. ‘Tasher Desh’ – Enjoy, if you dare!